A Man Has Been Arrested After The ULSTER SOCIETY of PREVENTION of CRUELTY to ANIMALS (USPCA) and the POLICE SERVICE of NORTHERN IRELAND (PSNI) Seized a Vehicle and Trailer Containing Two Red Deer Stags Which, It Is Thought, Were About To Be Hunted. The practice known as ‘Carting’ is Illegal and the Hunting Community has long maintained that it doesn’t exist. The trailer was registered to the County Down, Northern Ireland Hunt, but the Hunt Master said he “knew nothing about the events”. Although the animals’ antlers had been removed, a vet confirmed they were Red Deer Stags. The vet also said “they were tagged, indicating they had been reared on a farm”. However, the number which might identify exactly who had reared them had been scraped off the tag. 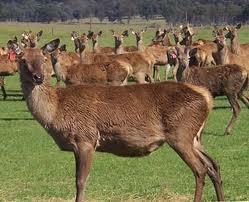 While it is Illegal to Breed Stags for Hunting, it is not Illegal to Hunt Stags in Northern Ireland. However, the practice is banned in the rest of the UK. Stag Hunting was recently outlawed in the Republic of Ireland. Stephen Philpott from the USPCA said “the County Down operation had confirmed the charity’s long-held suspicions”. “The people that do it pretend that they don’t. They would have you believe that the Red Deer Stags they Hunt they have come across while out riding and that they are actually Wild Animals,” he said. For over a year the USPCA had been monitoring a group of people they believed were organising stag hunts in County Down. That surveillance led them to conclude that a hunt would start on Tuesday outside Loughbrickland. Several 4×4 vehicles, horseboxes and horse lorries were observed arriving at the location where the hunt was believed to be starting from and then leaving. A woman approached the USPCA Inspector and asked him if he was there for the Hunt. She then told him that her husband was a Master For The Hunt and that she had received a phone call to say that the Hunt was cancelled and that people should leave the area. Mr Philpott said he believed that there had been a conspiracy to commit an Offence Under The Welfare of Animals Act. “How can anyone else call it anything else other than cruelty,” he said. “First of all there’s the stress they suffered in the back of that box, it was pitiful. The stags were later released into the wild. The USPCA and PSNI have seized a vehicle and trailer containing Two Stags which the USPCA believes were about to be released for Hunting. The practice, known as ‘Carting‘ is Illegal and the Hunting community has long maintained that it doesn’t exist. Please Sign Our Petition To Stop Raccoon Dogs Being Skinned Alive and Suffering a Slow, Sickening, Horrendous Deaths. Click Here To Sign Our Petition These poor animals need your support, tell all your friends and family, thank you.